10. At any given period over the last 25 years, Mr. Bean was being broadcasted somewhere in the world. Rowan was listed in The Observer’s Top 50 actors who are funniest in British comedy! Rowan is not famous by his own name instead people still identify him as “Mr. Bean”. Not many people know about his private life and we have brought 16 such lesser know facts from his life that will tell more about him than his on-screen character. 1. The character Bean was originally developed by Atkinson during his time at Oxford University from where he completed his master’s degree. 2. While Atkinson used to be a class clown when he was young, by the time he got to his pre-teens he developed self-consciousness and became rather quiet and withdrawn. 3. In 1981 he was the youngest one-men show in the West End. 4. Rowan Atkinson loves cars. He has also worked as a writer for British car magazines. 5. Rowan Atkinson's wife was Sunetra Sastry, daughter of an Indian engineer. Apparently, during the first date with Sastry, Atkinson allegedly said nothing except for a request to pass the ketchup. 6. Atkinson was invited at the wedding of Prince William and Kate Middleton. 7. Despite being known mainly as a great actor, he also starred in a series of comedy shows for BBC Radio 3 called The Atkinson People. 8. Once during a trip to Kenya the pilot of the private plane lost consciousness. Atkinson studied the plane until the pilot recovered and was able to fly back to UK. 9. Rowan Atkinson has a little known documentary, called “The Driven Man”. It was made in 1991. The documentary is about his passion and obsession for cars and about the psychology of driving cars. 11. Atkinson has earned significant money in his prolific film career. His current wealth is estimated at about £85 Million (approx. 130 million dollars). 12. Originally the name of the famous character, Mr. Bean was Mr. White. It was later changed to Mr. Cauliflower but finally ended up as Mr. Bean. 13. He celebrated 25th anniversary of Mr. Bean by taking his iconic mini to a spin around Buckingham palace in London. 14. 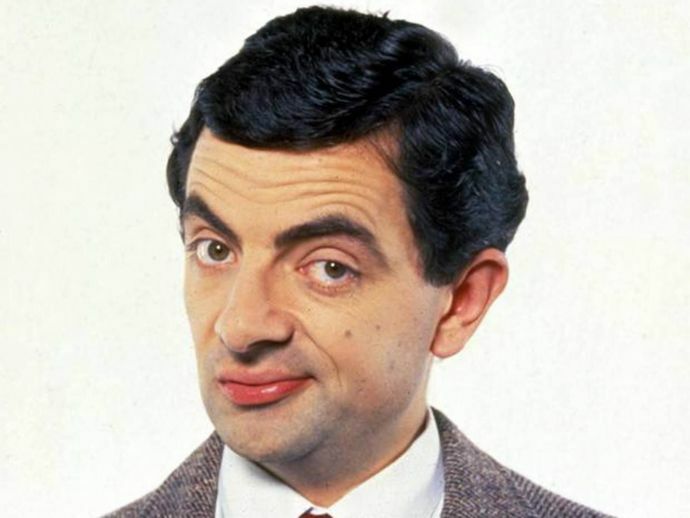 For most of his life, he has suffered from a mild stammer; Mr. Bean also hardly ever speaks. 15. Mr. Bean’s legendary ear wiggle is one trait Atkinson has in common with his on-screen alter ego. 16. In 2013 he was honored with a great title by Queen Elizabeth the II. She named him Commander of the Order of the British Empire.